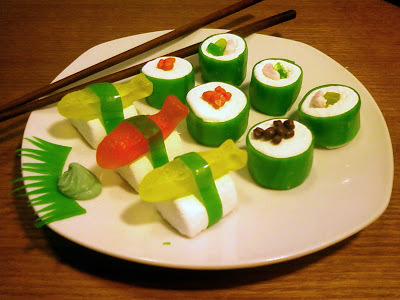 Candy sushi makes me just so gleeful! It whimsically brings together two of my favorite things. There is chocolate sushi by Koo-Ki Sushi. Not Martha made some adorable ones with twinkies that I really loved. Hers were inspired by The Secret Life of Food by Clare Crespo. I definitely want to buy this book. I decided to use marshmallows, and added the "wasabi" chocolate mint and fake grass that you get with take-out sushi. For roe, I used Nerds. They were fun to make but now I have an intense craving for real sushi. that's fantastic. eh that'd be sushi Garren would eat! so cool you have this site! this is the best thing i've seen all week. granted, it's only monday, but it's still pretty darn cool. i am totally doing this for my next party.